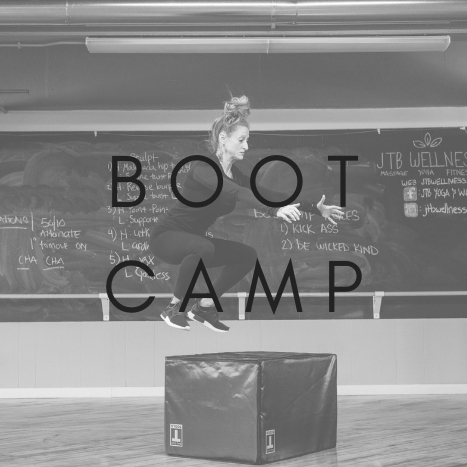 Our HIIT (High Intensity Interval Training) Boot Camp, Strength, and Flex classes will keep you constantly moving and never bored! Intense, dynamic, functional fitness including strength training combined with metabolic conditioning. From squats, lunges + push ups to core work + ballistic movements. All of the movements in these classes have scaling options so everyone is welcome. If you want a more targeted bootcamp style class, we also offer our popular A$$ + Ab$, Buti Sculpt, and HotCore classes. A$$ + Ab$ uses bands, body weight, + stations to sculpt + tone your booty and core. Sculpt includes high intervals of moving yoga poses followed by intervals of a low, static posture. HotCore – focusing entirely on the inner and outer units of the abdominal wall- is an interval class working from a high push up position and dragging the feet. High Intensity Interval Training (HIIT) workouts burn a lot of calories in a short amount of time (up to 25-30% more than other forms of exercise). This means you can get a great workout in less time than you would spend in the gym running or biking. Your metabolic rate stays higher for hours after the class too, as your body’s metabolism shifts toward using fat for energy rather than carbs. HIIT classes will sculpt your legs, arms and core, help you increase your lean muscle and reduce fat, lower your blood pressure and keep your heart healthy.